Has your doctor told you to add more fiber to your low FODMAP Diet? If you’re in the elimination phase, you might be wondering how to make that happen. My suggestion is this gorgeous low FODMAP fruit and walnut salad. Normally this is a summer salad. But, considering it’s an easy way to add fiber and protein to my diet, it’s always welcome on my plate. 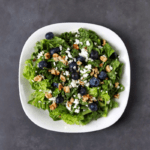 Plus, frozen berries make this low FODMAP salad budget friendly all year long. I like blueberries for this recipe in particular. They’re sweet and juicy, which plays really nicely off of the feta. I also stick to walnuts as my nut of choice. They have protein and Omega-3; both of which I need in my daily diet. Think this sounds awesome, but you don’t have time to try it now? You can PIN THIS POST for later. There are a few things you need to keep in mind when you make this low FODMAP fruit and walnut salad. Check out the notes below for tips on keeping this recipe FODMAP friendly. First, let’s talk about food volume. Even if all of your ingredients are low FODMAP, too much food in your gut at once can trigger symptoms. If you know you’re sensitive to food volume, try splitting your meal in two. Lettuce: The good news is, according to Monash University, most types of lettuce only have trace amounts of FODMAPs. This means you can eat as much lettuce as you want without adding to your FODMAP load. Some exceptions include radicchio which is limited to 5 cups per sitting and spinach which is capped at 3 3/4 cups. Don’t get stuck in a lettuce rut. Remember to switch up or mix and match your favourite leaves for different tastes and textures. Fruit: On their blog, Monash tells patients to pick one fruit per sitting. Some fruits have multiple FODMAPs or have high levels of FODMAPs. These can add up quickly, so pick one and stick with it. 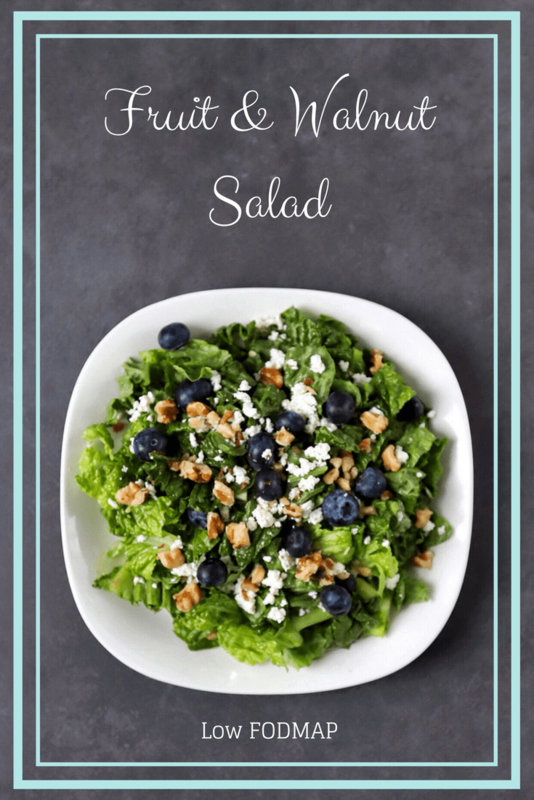 Cheese: I love using feta in this salad because it adds some protein to my meal. Plus, the brine can be used instead of a high FODMAP salad dressing. According to Monash University, IBS patients can handle a 1/2 cup of feta cheese per sitting. This recipe is within the recommended range. If you’re a stickler for proper salad dressing, my Balsamic Vinaigrette goes very well with this fruit and walnut salad in particular. You can use whatever kind of nut you have on hand (like peanuts, pecans, almonds, or pine nuts). Remember to check your app for the recommended serving size. Think this low FODMAP fruit and walnut salad will work for you? Don’t forget to PIN THIS RECIPE for later. If you're looking for a yummy way to add some FODMAP friendly fiber to your diet, try this fruit and walnut salad. The combination of sweet, salty, and crunchy ingredients blend together beautifully for a fresh and healthy summer lunch or side dish. Wash and dry lettuce and place on serving plate. Crumble feta over leaves. Add fruit and nuts. Serve immediately. This dish pairs well with my chicken pub rub. Get the recipe here. 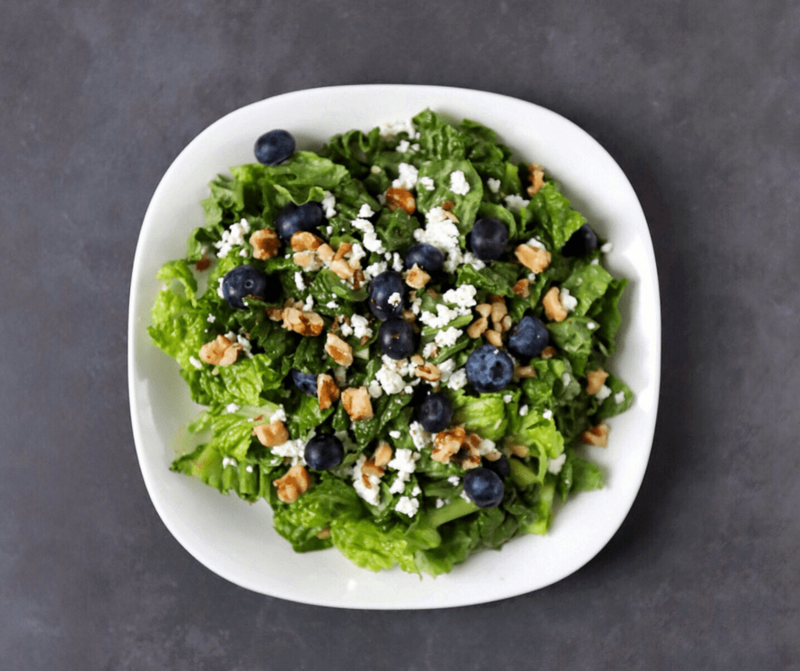 This low FODMAP fruit and walnut salad will add some tasty fiber to your diet. If you like this recipe, don’t forget to sign up for my mailing list below. You’ll get new articles and recipes delivered right to your inbox. Curious what else is happening in The FODMAP Formula kitchen? Follow me on Instagram for bonus recipes and a sneak peek at my latest projects. Together we’ll get the Low FODMAP Diet down to a science! My name is Amy, and I want to welcome you to The FODMAP Formula. As a fellow IBS sufferer, I have felt sick, embarrassed, and, once I started the Low FODMAP diet, very hungry! Let me show you what I’ve learned from my research, my support network, and some old fashioned trial and error. I am confident that together we can get the Low FODMAP Diet down to a science! 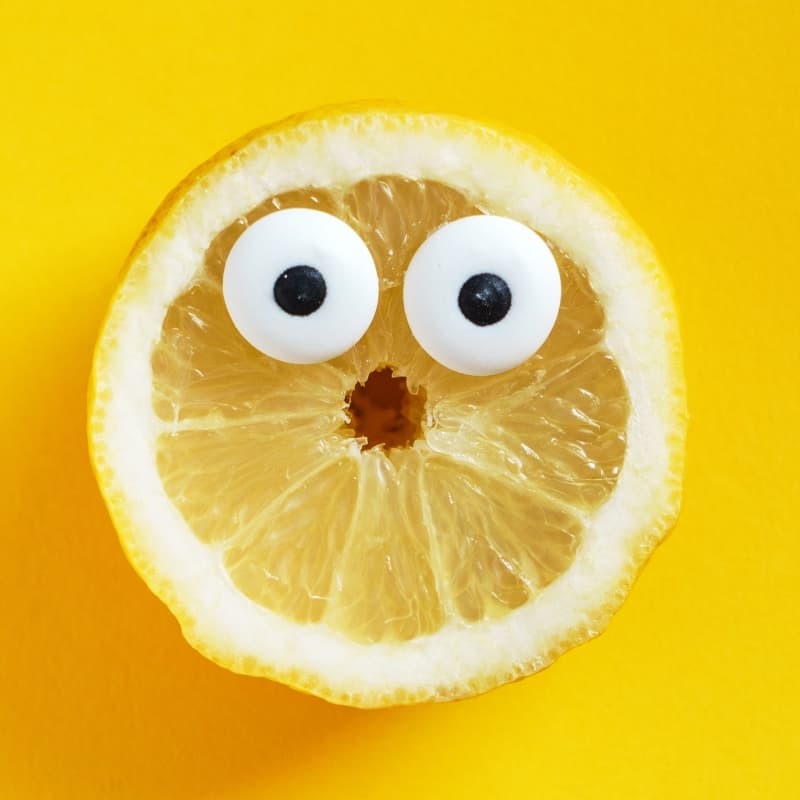 Feeling Sour About the Low FODMAP Diet? Check out my FREE low FODMAP mini-course and kickstart your low FODMAP Diet with confidence! CLICK HERE to learn more! Like your articles fresh off the press? Sign up for my monthly newsletter and get new recipes and articles delivered right to your inbox. Need some low FODMAP holiday inspiration? 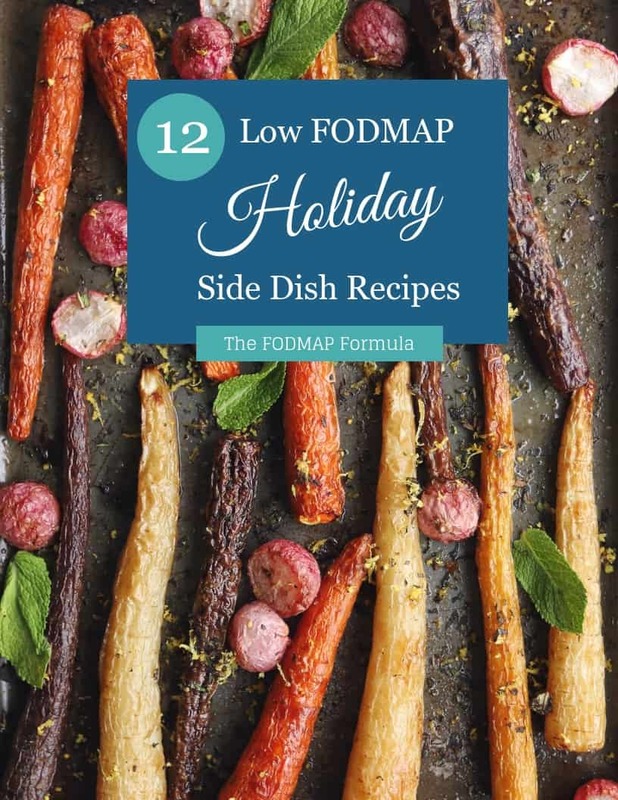 These side dishes feature foods with no detectible FODMAPs, so you can focus on your holiday instead of the low FODMAP diet. Grab your copy here. Just so we’re clear, I am not a medical professional, nor am I licensed by any institution to give you medical advice. Under no circumstance should you use the information provided on this website to diagnose yourself or your loved ones, or use the information provided in place of actual medical advice.